You have grown so much over the past few weeks that Mummy is finding it hard to keep up with your development. You are a week to 4 months old now and you have achieved some amazing social milestones while lagging a little behind on your motor skills (or are you just being lazy?!). Your physical growth also amazes everyone around you. You gained a hefty kilo just over 2 weeks, making you 6kg at 2 months. Auntie Sally and Auntie Yammie call you their gentle giant or GG in short. Actually, I Mummy kinda likes calling you GG too. Well... size does not really matter just as long as you are a healthy and happy baby. 10 weeks - Cooing has slowly evolved to babbling. There's more colour to our daily conversations these days, progressing from "ooooo"... to "ah!" , "ah-ooooo", "huuuuuuu", " huhhhhh" and "eiw!". And, shrieking at this point is your favourite. You are also kicking and moving a lot in your sleep. Papee & Mummy often find you at the bottom of the mattress in the middle of the night with your pillow no where to be found. Hence, we decided to get you a proper cot instead of letting you sleep on the floor. That of course did not stop you from moving in your sleep, in fact the cot has weirdly encouraged more movement and we often find your legs sticking out of the sides of the cot. Recently, you have even managed to turn 90 degrees in your sleep... and as Grandmama aptly puts it... you sleep like a clock! Oh...you are also starting to chew on your fists. It always amuses Mummy to see you attempt to put those little fists of yours into that even "littler" mouth of yours. 12 weeks - You started "school" this week. 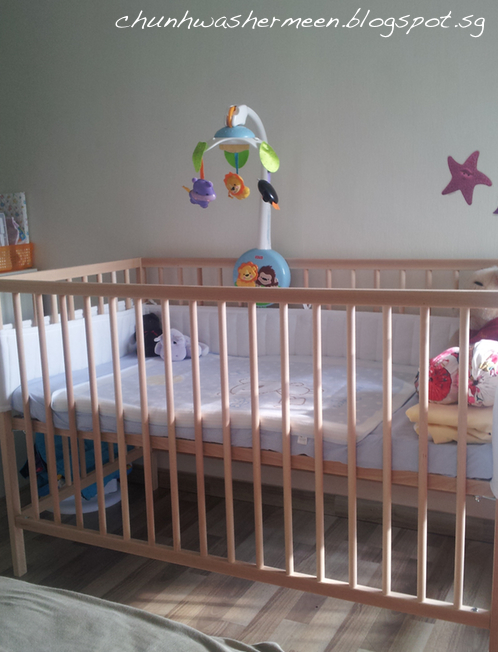 Papee & Mummy decided a month ago that we want you to go to infantcare when Mummy returns to work. We felt that you will learn to be more independent at the same time make good use of your time by interacting with other kiddos. It was a hard decision, but upon seeing how well you adapted, and how you have picked up good napping habits...Mummy felt well at ease. You have also progressed from chewing your fist to sucking on your fingers. Well done my boy! Your second time swimming, and you seem to be @ so much ease! 14 weeks - We discovered your flair for swimming this week when we brought you to the BabySpa. You took to the water very well, and enjoyed kicking yourself from one part of the tub to the other. This prompted Papee to buy a wet suit and a float us to take you to the swimming pool. Maybe you will be a national swimmer when you grow up... or a naval diver? 15 weeks - You enjoy yourself so much in school that you talk and talk and talk... and when your teachers walk away from you... you get angry and insist they return to in front of you so you can continue talking to them. You're a cheeky baby, and seems to bring so much joy to your teachers. You are also beginning to chew on your lips, trying to let Mummy know you are probably ready for solids. But my boy... be a little more patient... Mummy will probably start weaning you around month 4 after Dr Heng gives us the green light. Your neck muscles are also stronger now. You are able to lift you head at 45 degrees when lying on your tummy, at the same time hold you head up when we carry you upright! Progressing really well my boy! 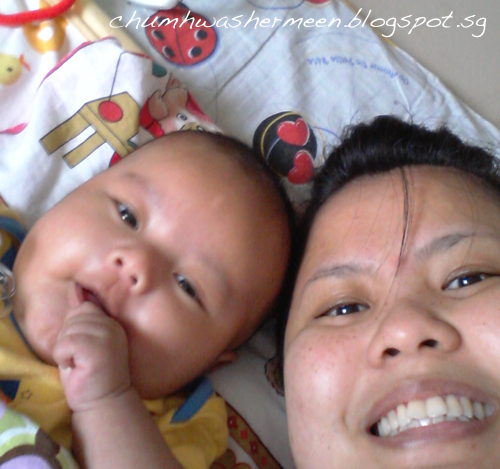 Mummy really cannot wait for you to be able to crawl and walk, so we can have so much more fun. In the meantime, all Mummy ask is for you to be happy and healthy!